These tube heat exchangers are ideally used for transferring the heat in industrial process applications. 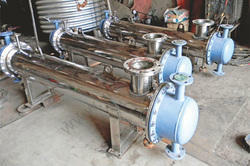 Our range is also available in u-tube design for liquid to liquid and steam to liquid applications. Looking for Condenser Heat Exchanger ?